Steam Will Power Tomorrow’s Planes! The oldest prime moverâ€”steamâ€”is staging a comeback. Read what amazingly logical things can be accomplished with new designs in planes through the use of steam as a power plant and control medium. EVERY once in a while we have to “get back to nature”â€”get back to the simple things our dads used. Often we find that we’ve been on an engineering merry-go-round and that the old gentlemen who were our forbears had some right good ideas in design, but were unable to use them to the fullest extent of their theories because the right materials were not available in iron, or steel, or something else. And every so often the subject of what tomorrow’s airplane will look like bobs up in some writer’s mind. He is usually hard pressed to get something really new to write about, so he lays it on thick and the resulting pipe dream generally makes an air-minded man who has any air “savvy” pretty sick. Recent developments in engineering activities have brought these two phenomena together again: steam and tomorrow’s airplane. Strangely, some real progress has been made, and we find that steam, used by our grand-dads as an old reliable medium, has been put into new clothes by the developments in materials to the point where it can be considered within reach on all engineering points to make an ideal power plant for a new airplane which will bristle with logical departures. Let us take a fundamental consideration: The power plant of the future Leviathan of the air by necessity must be more powerful than is at present practical to build with the present day highly complicated internal combustion engine. The limit is approached in gas engines when such ships as the Hornier DO-X must use twelve 600 h.p. engines separately mounted with all the mess of gauges, magnetos and so forth that must be duplicated time after time. Airplane designers are far ahead of engine designers in aircraft developments and many of the leading minds of the engineering world are striving to develop engines of suitable design for tomorrow’s airplane needs. Among them is Capt. Richardson, of the Great Lakes Aircraft Corporation, for whom the aeronautical world has profound respect. Also, working along different lines in this search which points toward steam as tomorrow’s motive power is Abner Doble, one of the world’s leading authorities on steam. Whether or not the ultimate power plant will be of the turbine type such as Richardson is developing, or whether the engine will be of the reciprocating expansion type as is being developed by Doble remains to be determined. Another consideration at once becomes obvious when we consider the possibilities of the steam power plant. These are the advantages which may be derived from the steam in the operation of controls, combination shock absorbers and retracting devices for landing gear, single throttle for all engines, heating of leading edge and propeller to prevent the formation of ice, heating of cabins, cooking of meals, generation of electricity for lighting and for radio equipment. The controls may be operated with the conventional control stick connected to two rotary valves sitting at right angles. The forward movement of the stick rotates the valve which is connected by steam line with the cylinders operating the elevators. The side movement of the stick, in like manner, operates the ailerons. The exhaust steam from these cylinders, like the engines, is led to the condenser which is just under the skin of the leading edge of the wing. The landing gear will be so arranged that the stresses are spread over the full length of the fuselage or center section instead of being concentrated at a single point, enabling the designer to use much lighter materials than is possible in the present type of gear. The first step in this direction is being taken by Junkers in his latest development the G38. Steam cylinders will be used to draw the landing gear up into the wing cutting the drag to a minimum. Unlike the present retractable landing gear, it will be only necessary to give a small faucet-like valve a quarter turn and the wheels drop down into landing position with a steam cushioned shock absorber behind them. The exhaust steam from engines and cylinders will be condensed and returned to its original state through the process of cooling effected by series of tubes which form the leading edge of the entire wing. This device not only serves as a condenser preventing the loss of water but acts as a heater to prevent the formation of ice on the leading edge of the wing, also warms the air which is conducted along the air ducts in the girders of the wing spars which furnishes heat and ventilation for the cabins. The propeller and engine may be combined as a single unit as shown in the illustration. 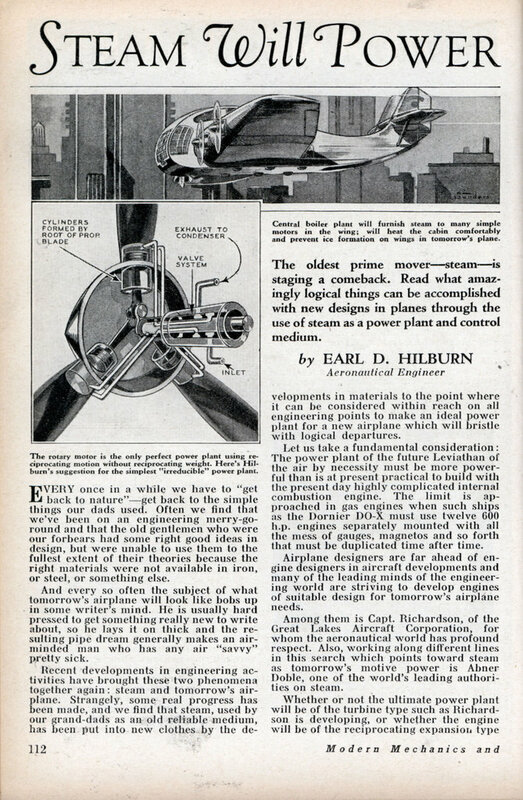 The engine utilizing the hub as a crankshaft which is fixed similar to that of the old Gnome rotary, with the engine revolving about the crank shaft opening and closing intake and exhaust ports which form the valve mechanism to drive the pistons operating in the shanks of the propeller blades which would carry off sufficient heat to prevent the formation of ice on the propeller. The generation of electricity will doubtless be accomplished by direct drive turbine generator set which like the other steam devices will exhaust directly into the condenser on the leading edge of the wing. The current derived from this source will be utilized in furnishing light and energy for the two way radio service and to drive the oil burner used in conjunction with the flash boiler, also in operating the Sperry mechanical pilot which takes charge of the ship after the pilot takes it into the air and sets it on its course. The pilot is then free to navigate his ship without that of keeping it on an even keel. The navigating instruments will be similar to our present day direction finders but instead of having just one loop aerial it will have two mounted on a pedestal beneath the chart table with movable pivots and having a pointer connected to each loop aerial by means of flexible shafts. The Burnelli transport plane comes nearer being of the flying wing type (which, of course, is the type of tomorrow) than any other transport although Ford engineers are at present using the wing as cargo space. But when the wing is made thick enough for passengers to stand erect in, as it must be for very large transports, a fuselage is no longer necessary and will be replaced by booms extending aft to support the tail groups as is the present practice with Burnelli and Sikorsky. The primary structure will doubtless be similar to that used in the Akron and her sister ship the Macon except instead of angular dural section it will be welded steel tubing which forms the girders extending from wing tip to wing tip. These same tubes will be used as steam lines to conduct the steam from power plant to engines, likewise to control cylinders, and to act as return tubes to the condenser. Less strength will be needed in the individual members than in present design due to the distribution of load throughout the entire length of the wing. Page 3 has what may be the original version of X-ray Spex! Hilburn went on to be a major engineer for NASA. See http://www.archive.org/… for a film that includes a prototype steam-driven airplane, along with an advance steam-powered train (not what you think) and car. Shame they were never mass-produced. 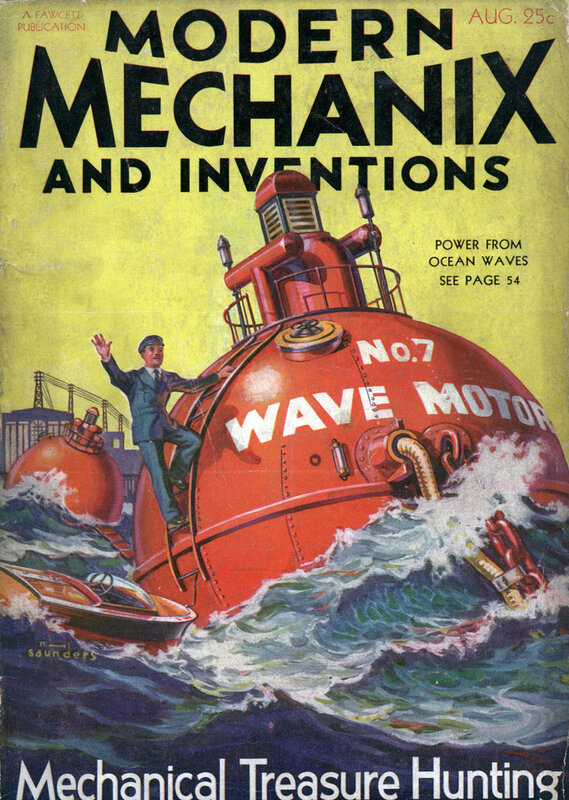 Steam (Nuclear heated) powers today’s submarines, and may someday be used in airplanes.